Listen to this track by former angry young man turned happily-married stalwart singer-songwriter Graham Parker. 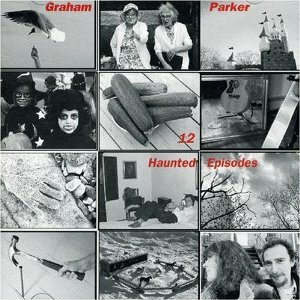 It’s “Partner For Life”, an ode to love, commitment, and the realities of adult relationships as featured on Parker’s 1995 album 12 Haunted Episodes. By the 1990s, Parker had been prolific as a writer and performer, even if his mainstream success didn’t match that of his contemporaries to whom he is often compared; Elvis Costello and Joe Jackson, both of whom held Parker as an influence. He had become, and remained to be, a cult artist. Parker had been through the wringer with various major label record companies as a result, suffering a lack of support and poor sales of his albums. Or was it the other way around, with the lack of support resulting in his cult status? Either way, he’d established himself as an artist with a consistent body of work, despite the hardships and vicious cycles he’d experienced while tangling with the majors. He certainly succeeded in consolidating a lasting core audience, doing so by being a steadfast songwriter, record maker, and tireless live performer. By this record, he’d cut the shackles of major label skulduggery loose and gone indie on the Razor & Tie label. As such, there is a certain liberation that can be heard in a song like “Partner For Life”. And there is another kind of liberation to be found in this song, too. With this song, the rewards and challenges of marriage and parenthood are central. Looking for meaning to bolster one’s commitment to those relationships, even when separated from loved ones, is the engine that drives the emotional core of the song. This is a portrait of a man who is looking for ways to stay connected, even when on the road alone without them. In some ways, this is something of a rebellion against the rebellion when it comes to the life of a rock musician. Instead of hotel rooms strewn with drugs and groupies, we’re given ruminations of paintings on the walls with “couples intertwined as if fighting for their lives”, which in one way certainly describes the nature of adult relationships. Here, fighting for one’s life is about identifying and clinging to what’s really important, with that fight being the key engine to self-discovery. And really, that is a kind of liberation too. It’s a kind of freedom that can only be found when you decide to put everything into what you’ve come to realize will provide the best return, especially as you grow older; security, love, and the unique treasure that comes from knowing, and being known by, another person. If you’re going to write a love song, you don’t get much better inspiration than that. Graham Parker is an active musician today, soon to release a new record with his former war buddies The Rumour later in 2012; Three Chords Good. The reunion came out of a recent documentary about Graham Parker, Don’t Ask Me Questions which in part traces the thread of Parker’s career as a cult artist, with worldwide fame just out of reach despite his obvious talent and the esteem of his fellow musicians. The film was partially funded by die-hard Parker fans. For more information, read this article about Graham Parker & The Rumour and their involvement with Judd Apatow’s new movie, tentatively titled This Is Forty, coming out later this year. And of course, don’t forget GrahamParker.net for up to the minute news. Lovely song, lovely lyrics. It sounds a bit like Elvis Costello singing a Van Morrison song. And yes, I think Parker also hooks in very much to the same musical reference points that Morrison does. I always think of Parker as the British Tom Petty, although with fewer Dylan notes, and more soul music influences. They even came out at the same time, with both men backed up by a solid band (Petty’s Heartbreakers, and Parker’s The Rumour). It’s too bad that he didn’t share the same level of attention. It used to be that an artist’s 3rd or 4th album was the make or break – or it seems that way in retrospect. I still can’t figure out why ‘Squeezing Out Sparks’ wasn’t massive. As a listener and a fan, I sensed ‘Heat Treatment’ & ‘Howling Wind’ were the perfect stepping stones to a break through album. Years ago I went to see Cheap Trick because the Rumour were the support act (you could do that than when tickets were $9); it was an odd pairing that didn’t go over very well. He also tended to get lumped in as an afterthought with Costello, Joe Jackson and Nick Lowe/Rockpile. Perhaps that’s his career in a nutshell, he never caught a decent break. “Squeezing Out Sparks” is a great record! I haven’t listened to it in a long time — I should dust it off and give it a listen again, soon. “Squeezing Out Sparks” was a critical hit with the big publications, included Village Voice, etc. Later, Rolling Stone would add it to the “bestest records you ever hoid” list, although I guess they’re known for listing records that are cool in retrospect – or make them look retrospectively cool. But, none of the songs off of it hit AM radio. I remember hearing lots of Joe Jackson around 1979-82. But, no Parker. I would have loved to have heard “Local Girls” blasting out of the radio in 79-80. That was a very fertile period for pop radio, and it would have taken off for sure. But, I never did hear it. It’s a total mystery to me why this was.It’s a tragedy. Around ’79-’80 we used to hang around a little downstairs bar on Montreal’s Crescent Street. I was in one afternoon by myself during the week (must’ve been record shopping) when Barb the bartender asked me if there were any songs I’d like added to the jukebox. This was sort of like asking if I’d like free beer. On the following weekend when we all turned up, the juke now had ‘Local Girls,’ a couple of Clash songs & a few others I can no longer remember, but it was freaking magic. Geoff, you should have had a word with Mercury Records, who distributed (not very well, apparently) Squeezing Out Sparks in North America. Parker had to write “Mercury Poisoning” to get their attention. And of course, that song didn’t get play on jukeboxes and car radios either. That was his first song of his set at the Cheap Trick gig!